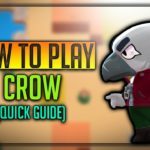 Brock - Brawl Star Complete Guide, Tips, Wiki & Strategies Latest! 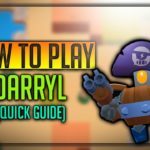 Home » Brock – Brawl Star Complete Guide, Tips, Wiki & Strategies Latest! 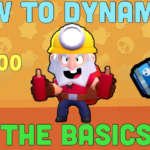 Brock is a powerful Brawl Stars and he is one of the underrated Brawlers, Who does a incredible damage to a single target, When it is done properly. 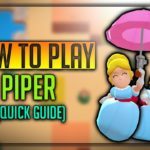 Brock is best supportive Brawler in the game, Let’s discuss Brock’s Strategies, Guide, Tips, Wiki, Skins, How to unlock and much more! Brock is a powerful common type Brawler, He is unlocked when you have 1000 trophies. Brock is stylish Brawler, Who is holding RPG in his hands. His attacks “Rockin’ Rocket” are highly precise and focused, And if it hits an enemy, It does devastating damage. His Super “Rocket Rain”, Projects rain of rockets over opponents, Destroying everything in that area. Brock is good long ranged missile men with great accuracy. 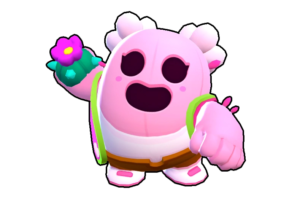 Let’s have a look on Brock Brawl Stars Wiki! By the time, We all know that Brock has a Rocket Launched in his hands, Shoots at an accurate, Precise area, Dealing good damage. Despite rocket’s dealing good damage, Reloading time of the rocket and rocket reaches enemy bit slowly, Enemy could evade easily. So, Care should be taken, We should guess and launch enemy movements to safely land missiles on enemies body! Brock’s Super Attack is known as Rocket Rain. Rains multiple missiles over the area, Whatever things in that area, It gets destroyed completely on that area, Giving good area coverage. He launches around 9 missiles over a good large area, Dealing incredible damage. His Super can destroy every obstacle on his way. The range of his attacks and Super are almost the same. Brock becomes deadly after level 9, His main attack rocket will now cause flame on the impact area, Which is capable of damaging 300 per second and it will disappear after few seconds. Very good for area control like barley. Friendly flames will be in blue colour and enemy flames would be in orange colour. Brock has an extremely Precise long-range shot, Which you can guess and launch on the enemies that are coming on that way. He can inflict heavy damage. Brock’s Super helps to clear out the area especially low – medium HP Brawlers and also destroy obstacles there. Brock can help his team to capture main points, Core points of the map, Very Easily. 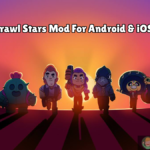 Brock’s Rocket will make opponents run cutting down their possible areas of escape, It will be a huge treat for Melee Brawl Stars nearby, Chase them and destroy him. With Beefier Brawl Stars as support, Brock is almost deadly as anything, As he could predict enemy movements easily. Brock has really low HP like Colt, Whenever a close combater reaches nearby, Brock is almost dead. Brock has very slow reload time. 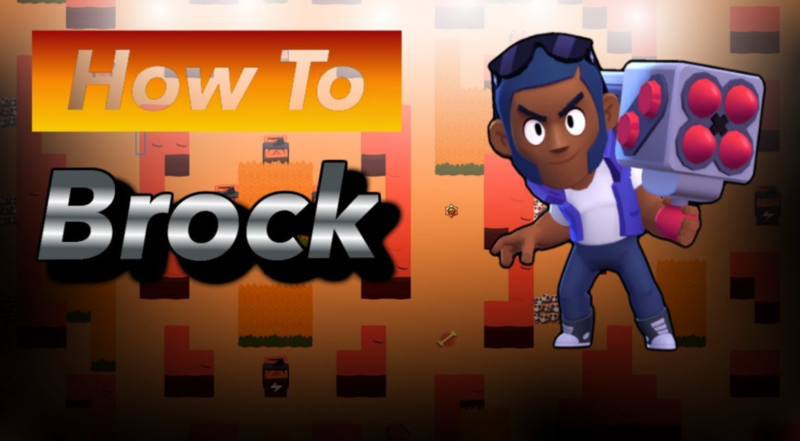 His missiles are easy to dodge because it reaches slow, So it might be tough for beginners to go with Brock at starting. Since Brock is a long-range shooter, Avoid picking him in the maps having a lot of obstacles. 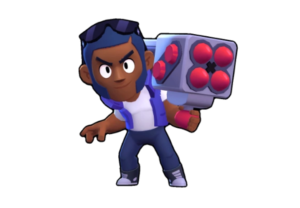 Brock could be used very easily, Like other Brawlers, Use left Analog to rotate and move his direction, Right analog to swipe, Release to shoot and destroy opponents, Tap to fast fire. While using Super, You have to press the Super Button, Select the area and shoot. As Brock performs very good at long range, Always maintain a distance from enemy Brawlers. If there is any close melee combater in your team, Support him from behind, You can take kills easily. While using Brock, You should predict opponent movements and attack, As his rockets could easily be dodged. Brock’s Special could be used to control area, Use it to capture core points in map such as Gem Spawning area, Heist defence. Use Brock’s Special to destroy opponents who gathered or grouped up in an area. Brock’s attack could be used to find out enemy Brawlers hiding in the bush, Without going in grass blindly, Fire an empty missile over the area, And get the advantage of it to find out. Never ever shoot all the rocket’s at once in unnecessary situations as his reload time is very slow, Having no rockets will make you defenceless. Avoid going near close combat Brawlers! Brock is very good against Crow, Colt, Jessie, Bull, Shelly! Brock is very good at Gem and Grab, Heist. 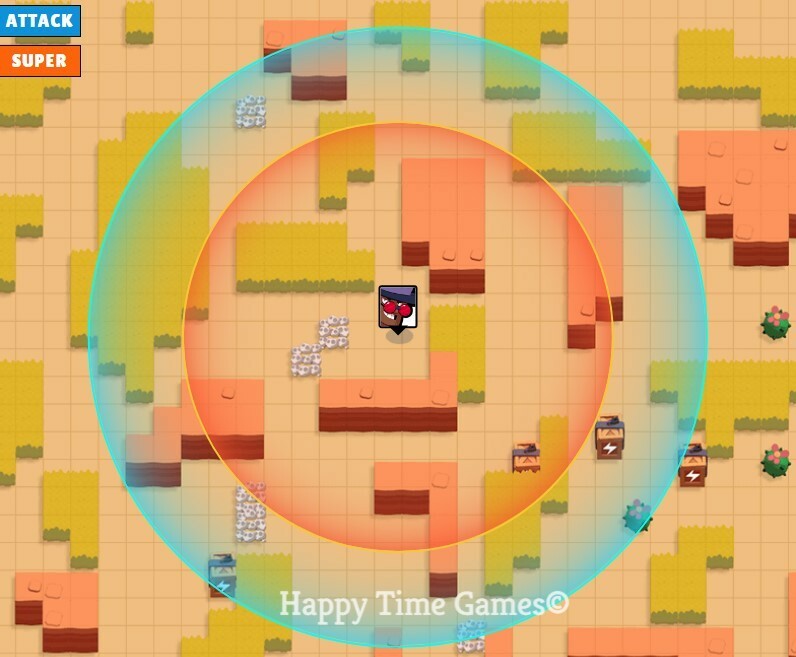 Brock could easily capture the centre area initially with his long-range missiles, And again he can use his Super to capture the area, Or defend allies holding gems! He is a great pick for Gem Grab. 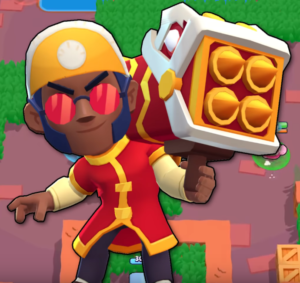 Brock is a good defensive player in Heist map, As he could easily defend his heist, On offence he could use his abilities to destroy opponents obstacles which preventing our team to reach their heist. 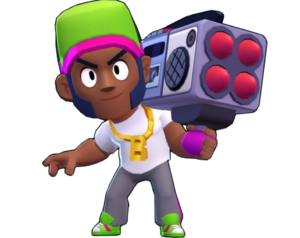 Brock’s Boom box skin cost 80 Gems, Either gather gems and buy from the shop or you can spend some bucks to look cooler. Lion Dance brock skin is upcoming new skin. 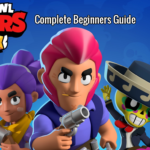 We hope you have liked the article on Brawl Stars Brock Complete Guide, Brock is a powerful defensive player, He can give opponents really a bad time, Use him properly, Make sure not to get close, Support your Melee brawler to get maximum effects.